I was born into a Christian family (Methodist) while my secondary education was at a Methodist college. As you can see, I was brought up as a Methodist. Though my father practised Christianity but it was not the religion of his father. My grandfather practised Ome N’ala Igbo (Igbo traditional religion). Then, why didn’t my father and his generation follow the religion of their fathers? The answer is simply because the British colonialists asked them no to. The British brainwashed them into believing that any religion other than Christianity was and is still – idol worshipping. But, did my grandfather and his peers worship idols? Let me answer this question by considering if, at all, Christianity introduced a method of worship that was different from Ome N’ala Igbo. Before the introduction of Christianity, Africans had their system of worshipping God. They had sacred places of worship and altars that were presided over by Priests. They also had lesser gods that serve as a go-between them and the supreme God named Chineke in Ome N’ala Igbo. But they never bowed before these gods but to the supreme God (Chineke) in heaven. However, when Christianity was introduced, the British colonialists and their missionaries replaced the African sacred worship places with Churches. They retained the altars in their Churches including the Priests. And for the lesser gods, they introduced a carved Jesus on the cross, which all members must now bow to and worshipped including accepting him as their lord and personal saviour. That was the beginning of idol worshipping as introduced by Christianity. Hence, my grandfather and the generation before him never worshipped idols. They worshipped the God of their forefathers just like the Jews worship the God of Abraham, Isaac and Jacob. Well, as my father and his generation abandoned the religion of their fathers (Ome N’ala Igbo) for Christianity, so did they introduce their children to the new faith. And so, I became a Christian by default. I was compelled to attend Church service every Sunday, bowed before Jesus on the cross and accepted Christ as my lord and personal saviour. 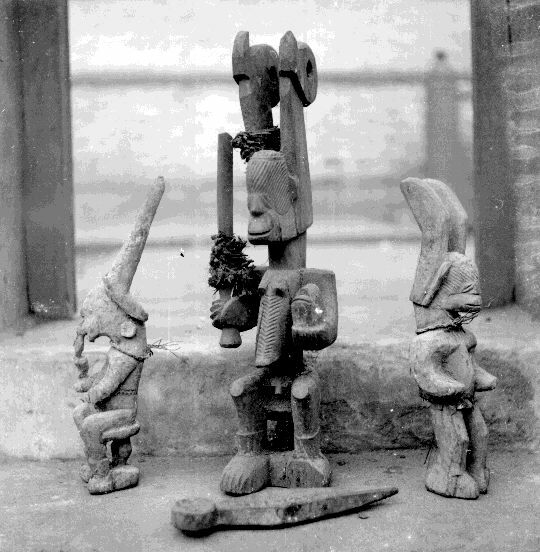 My family and I weren’t alone in the idol worshipping brought by Christianity; the entire village and Africa as a whole worshipped this foreign god. And since then, Africa has never been the same. The consequences of abandoning our way of life was slavery and colonialism, which was why the British and their missionaries came to Africa. They didn’t come to win any soul for their god as they claimed but to colonise the continent. All the same, when I came to London, UK in the early 1980s to further my education, my observations and experiences led me to question the sincerity of Christianity. As someone who was compelled to attend Church service every Sunday morning; I quickly located a Methodist Church where I will continue my Sunday Church service. But on my first Sunday at the Church, I found out that the place was half-filled and the majority of the attendees were old people. It was the same scenario on the second and third times. What purpose I asked? He laughed and said, young man, the purpose of Christianity is Slavery, Colonialism and Oppression etc. Do you think that the true God will be in a place where those injustices are perpetrated? I said No; and he replied, you answered correctly. Now, the recent shootings in Charleston where Dylann Roof killed 9 black worshippers in their Church has taken me back to the statement I heard decades ago; that Christianity was a scam. I therefore ask, if Christianity wasn't a scam; why didn't God save HIS people from Mr Roof, the agent of death who actually stayed with his victims for more than an hour worshipping their god? Let's remove the term religion and use the term...form of worship....now I will ask how does Chinese instruct mankind to worship him? Are there any inspired directions given by him by which we can follow to be acceptable to him?